Pay attention to the clamping section of the terminals. It is convenient to paint this section with heat indicating paint. 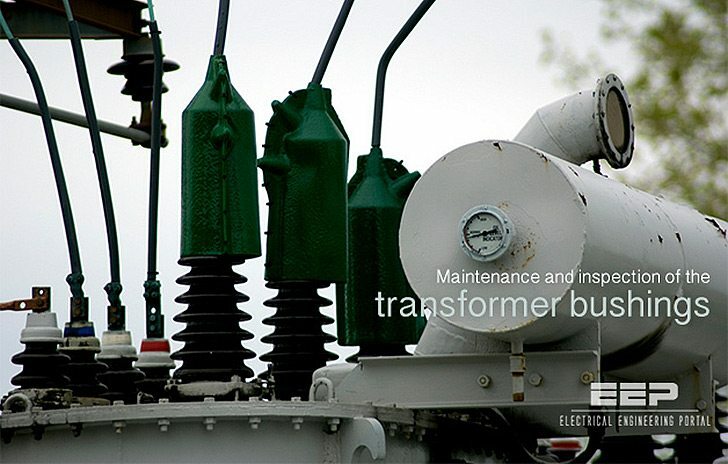 When there is much dust and salt, a clean up must be performed and to do so, the transformer must be place out of service and use water, ammonia or carbon tetrachloride. If they are very dirty, use concentrated hydrochloric acid diluted 40 or more times in water. The solution should not be in contact with any metallic part; after the cleaning the porcelain parts, these must be neutralized with water that contains sodium bicarbonate in a proportion of 30 grams by liter. As long as it uses a chemical solution, make sure of washing it after with fresh water, so that no strange elements are left. In systems in which will be difficult to stop the operation of the transformer for cleaning, or in zones where there are many damages by the dust or the salt, it is being using recently a washing method designated “of hot line”. It is a method to wash the equipment without stopping its operation, and there are 2 or 3 forms of doing it. In any case, it must be verified the degree of dust and salt, the quality of the water to wash and the method of waterproofing when the cleaning is done. Check if there are any damages or oil leaks in the bushings. The methods to detect the deterioration of the insulation are the measurement of the insulation resistance and tan ∆. The measurement of the insulation resistance in the bushings is not simple, since the bushing and the winding of the transformer should be independent; nevertheless, the measurement must be made the best way possible. The measurement of the tan ∆ is also difficult, since the bushings should be separated from the transformer in most cases. The evaluation of the result of the measurement should not depend solely on the absolute values obtained, but on the values obtained each year and from the variation among them. If there are large discrepancies in the values, special attention is necessary. When the insulation resistance is superior to 1000 MΩ at normal temperatures, it can be considered as good condition, but the value of the tan also must be taken into consideration for the evaluation. The excessive heating of the terminals in most cases is due to loosening. If this condition is observed, eliminate the dust or dirt from the parts from contact and tighten firmly. The cleaning of the bushings must be done according to what was mentioned. If the damages are very serious it must be replaced with new ones. Check the various pieces of the bushings to see if there is any oil leaks. If oil is leaking through the gasket, tighten it or replace it. If there are bushings of immersed in oil type and the oil leak is through other part of the bushing, report it to the manufacturer. Keep the bushings in a vertical position and in a dry place. It is recommended to keep them in their original packaging. how to calculate no. of earth electrodes in a substation 11kv/440v three phase 500 kva transformer two nos. I join as a chief engineer in a textile company . I found there installed two transformers of 3000 kva each 11kv to 440 volt. . While total sanction load is only 3000 kva. And only aprox 1200 kva running load on each transformer , which is 40 % of transformer capacity. So I wants help to know that is ok or not ok ? And what is losses and how much energy losses ? Because utilisation is less then 85 % . Did you mean to use with the Thermal device? can you tell me more about all inspections? that’s good but plz add pics!! !